Each FLL Jr. kit provided by G-REC contains 3 LEGO Simple Machines kits (photo at bottom of this page). These kits come with printed build instructions. You can have the kids follow these guides to build variations on the same type of simple machine and compare the models to get a hands-on understanding of how various simple machines work. It is essential that you spend time on this part of the program in the early weeks, because once your team starts building their team's model on the LEGO base plate, they will need to use LEGO from these kits in the their model. At least one simple machine and one moving part is required in every FLL Jr. model. ** Reminder** You will want to complete your simple machines instruction before the team begins to build their model, because then parts from the Simple Machine kits will become part of the model, which will not be disassembled until the end of the season. Three of these kits are included in the G-REC FLL Jr. coaching materials, enabling children to work in groups of two. Each kit includes a set of instruction booklets. 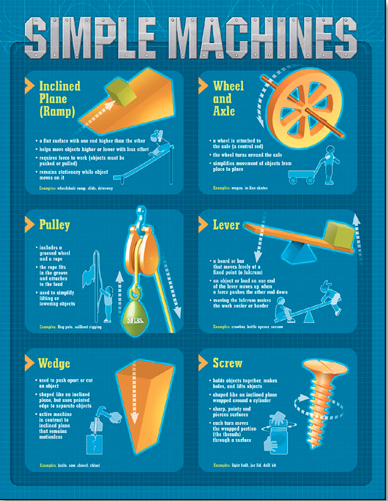 Students can build variations to experiment with different simple machines and understand how they work.